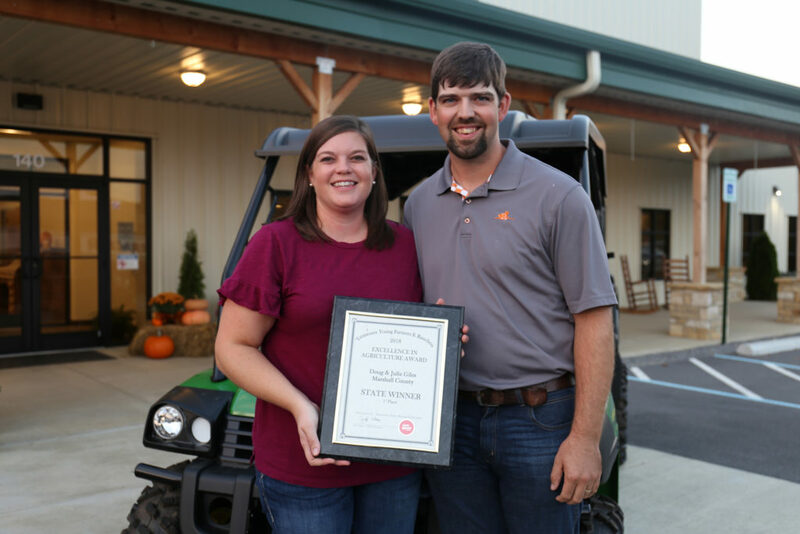 Columbia, TN October 11, 2018 – During the Young Farmers and Ranchers Fall Tour, Marshall County’s Doug and Julie Giles were named the state winners of the Excellence in Agriculture Award and will go on to compete in New Orleans at the American Farm Bureau Federation’s Convention in January. The Excellence in Agriculture Award recognizes young farmers and ranchers who derive the majority of their income for an off-farm occupation, but who actively contribute and grow through their involvement in agriculture, their leadership ability and participation in Farm Bureau and other organizations. The Giles farm beef cattle in Marshall County, with Doug’s primary occupation as the Assistant Director of Marshall County Solid Waste and through her position as a 4-H Extension Agent in Marshall County, Julie serves about 1,000 youth annually. Both Doug and Julie have been very active in the Young Farmers and Ranchers program, as well as the Marshall County Farm Bureau and their local community. Both have competed and won the Tennessee Collegiate Discussion Meet and the Tennessee Discussion Meet. As statewinners, the Giles receive a John Deere Gator sponsored by Farm Credit Mid-America and a trip to the American Farm Bureau Convention in New Orleans, courtesy of Tennessee Farm Bureau in January 2019, where they will compete for national honors with other state winners. The national winner will get a 2019 truck and paid registration to the YF&R Leadership Conference in Milwaukee, Wisconsin, and the second place winners will receive a new Case IH tractor. Walter and Amanda Malone of Sullivan County were the second-place winners of this year’s competition. The Malones were also this year’s hosts of Fall Tour where the group made a stop at their family’s agritourism site, Cleek Farms.